4:30 p.m. (PT): Thanks to rumors that the Celtics might trade the No. 5 pick, Wally Szczerbiak and Delonte West for a soon-to-be 32-year-old shooting guard coming off double ankle surgeries (Ray Allen), I just spent the last 20 minutes on basketball-reference.com trying to find one great shooting guard who didn’t decline significantly in Years 12 through 14 of his NBA career. Here’s the list: Reggie Miller. That’s it. Also, I just threw up in my mouth and some of it went up the back of my nose. 4:32: David Stern’s intro could be best described as “wobbly.” When he mentioned that New York was home of “the Knicks and the Liberty” and a couple of fans predictably jeered, he didn’t even give us a sarcastic pause. They might have to take him into the shop for a tune-up. 4:34: Funny shot of 12 employees in Portland’s draft room realizing they were being shown on TV, then inexplicably standing up and applauding happily. It’s just like I feel about the rumored Ray Allen trade, only the exact opposite. 4:35: Jay Bilas calls Greg Oden “the ultimate high character guy.” I would have gone with Gandhi. 4:36: Stephen A. Smith on Portland taking Oden: “They better pick him — THAT’S THE SENSIBLE THING TO DO.” We’re nearing the phase of his career when Smith might need to change his gimmick, kind of like when Puffy changed to P. Diddy. I think “Stevie A.” or “The Notorious S.A.S.” could buy him another two years. That’s the sensible thing to do. 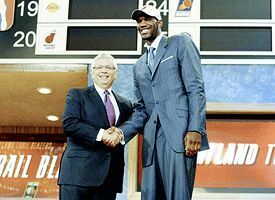 4:36: The Blazers select Greg Oden with the first pick — a moment that would have been much more exciting if Ric Bucher and his new Gordon Gekko hairdo hadn’t ruined it. (Note: After Buke’s report, I wanted to “break” the report that the Sonics would pick Kevin Durant second; none of my editors would oblige. Cowards.) Meanwhile, Oden gets a full-fledged, “Thank God he seems like a good guy” smile from Stern during their handshake. If there was a bizarro version of the moment when he shook hands with J.R. Rider in 1995, that would have been it. 4:39: “You can’t teach 7 feet!” The Notorious S.A.S. screams. 4:40: I have to say, Oden seems like a legitimately good guy. Even Stu Scott seems charmed. If the Blazers were “Platoon,” Oden would be Willem Dafoe, Zach Randolph would be Tom Berenger, and Brandon Roy would be the Charlie Sheen character caught in the middle between good and evil. The more I’m thinking about it, they might need to trade Zach. Like, right now. the guy I’d been rooting for the Celtics to get since December. 4:43: They just spent the last two minutes discussing Durant, and I didn’t even feel jealous of Jay Bilas’ orgasmic hyperbole because I was so rattled by the Allen trade. (Hands off, Jay — I have the No. 1 media man-crush on Durant.) To be clear, I’m a big Allen fan: He’s an excellent player; he always wanted to play in Boston (unlike everyone else in the league); I would have loved this trade if he were 28 or 29; and it’s hard to top the comedy of Ray Allen and Allan Ray playing for the same team. 4:46: Meanwhile, the Hawks finally do the right thing in an NBA draft: They took the third-best guy (Al Horford) at No. 3. Billy Knight, it’s like we don’t even know you anymore! Even more shocking, it looks like Joakim Noah abandoned his ponytail, slapped on a bow tie and hired Carrot Top’s hair stylist. Let’s hope he doesn’t drop into the second round because of this. 4:51: Al Horford speaks English, Spanish and Portuguese, but unfortunately, he doesn’t speak Stu Scott. Have I used that joke before? Ah, screw it. I feel more depressed than an Elliott Smith album right now. 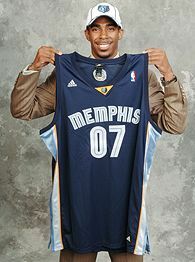 4:52: Memphis grabs Mike Conley Jr. at No. 4. Really good pick. I’d tell you more, but I’m busy trying to find the right adjective for my father on the phone right now. Beaten down? Distraught? Perplexed? Horrified? Apoplectic? All of them fit. He’s absolutely appalled by the Allen trade. or for that matter, any population other than good-natured, heavyset Caucasians who enjoy dark beer and fried food. This is gonna end badly. You’ll see Brett Favre booed at Lambeau before you see Yi putting on a Bucks uniform. 5:08: Yi’s interpreter-less interview with Stu Scott wins the ESPY for “Best impersonation of Andre the Giant by a Chinese guy” and “Biggest lock to be turned into a YouTube clip by at least 500 different people.” Although you have to admire him for doing it. I’m starting to come around on Yi — the thought of him shoveling out his car in minus-10 degree weather in January while fighting back tears and screaming, “Why????? Why???? ?” in Chinese is delightful for some reason. Too bad they’ll trade him. If the Chinese government can torture Jack Bauer for two years, it can definitely break the Bucks. 5:11: You have to love the T-Wolves — they waited a year too long to trade KG, then frantically shopped him for the past week, and while all this was happening, owner Glen Taylor headed to China for his honeymoon. Hey, Kevin, good luck dealing the most important player in franchise history, I’ll be in Beijing with my fifth wife! Anyway, they just grabbed Corey Brewer at No. 7. Another well-done, logical pick. We’re 5-for-7 right now. 5:13: Our best ESPN graphic of the night as Rachel Nichols discusses Charlotte’s plans at No. 8: “Jordan actively involved in the draft.” You know you’re a shaky GM when TV networks feel the need to point out that, yes, you have decided to become actively involved in the selection process of a lottery pick. 5:19: Just won a three-team parlay on Charlotte grabbing UNC’s Brandan Wright at No. 8 (the old WNBA strategy strikes again! ), Jay Bilas loving the pick (“He runs the floor like a deer!”) and Bilas calling his wingspan “extraordinary” (easy money). maybe I can talk myself into this. That’s not a bad top three, you have to admit. 5:26: Chicago takes Carrot Top Noah at No. 9, opening the door to use Ben Wallace’s salary in a trade four months from now after Kobe kidnaps Mitch Kupchak’s family and holds them hostage in an undisclosed location. Plus, we got some extended shots of Noah’s happy mother. A win-win all the way around. Hey, did you know she was Miss Sweden during the same year that Jerome Bettis was growing up in Detroit? 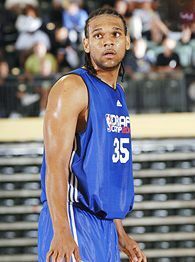 5:32: Looking disturbingly like Chris Mihm, Spencer Hawes goes 10th to the Kings. Now they have a young center who can’t rebound or protect the rim, an aging center (Brad Miller) who can’t rebound or protect the rim, a guy who started the biggest melee in NBA history (Ron Artest), the coach from “Hang Time” (Reggie Theus), tons of bad contracts, and owners (the Maloofs) who’ve made more reality-TV-show appearances than every other NBA owner combined. What a mess. O.J. Mayo should just buy a house in Sacramento now and get it over with. 5:37: The Notorious S.A.S. spends 60 seconds questioning Chicago’s Noah pick, wonders why the Bulls didn’t address low-post scoring without mentioning a single alternative (either in the draft or through trade), then adds at the end, “Again, [John] Paxson knows what he’s doing, he’s a phenomenal executive.” I’d like that minute of my life back. No, really. 5:39: Our long national nightmare is over: The Hawks finally drafted a quality point guard (Acie Law IV). It’s like Billy Knight just pooped in our fridge and ate a whole wheel of cheese, isn’t it? Mark Jackson celebrates the occasion by making a midget joke. what???? Fortunately, Bilas saves the day by praising Young’s upside. 5:59: Our last two blue-chippers get taken: Julian Wright (Hornets) and Al Thornton (Clippers). Love both of those picks — not just the players, but the fits with the teams. Has there ever been a first round in which more lottery teams did the right thing? And you’re not gonna believe this, but Bilas loves Thornton’s motor. What about my motor, Jay? I’m gamely plowing through my diary even though my favorite team may have just made this decade’s version of the Webber/Richmond trade. 6:07: After Detroit takes Rodney Stuckey at 15, Bilas calls him “a poor man’s Dwyane Wade.” Hmmmm. Who’s the homeless man’s Wade? Damien Wilkins? Marquis Daniels? 6:11: Nick Young goes to the Wizards at No. 16, breaking the record for “fastest we’ve ever cleared out all the prospects invited to the draft” (usually there’s a one straggler). More importantly, he’s dressed like Mr. Roarke. Smiles, everyone, smiles. 6:14: Good God, Isiah finally made a good trade! It happened! Somehow, he just landed Zach Randolph for Channing Frye and Stevie Francis! I’m shocked! What’s happening to this league? Even Isiah is doing the right thing! I can’t stop using exclamation points! How was that the best Portland could do for Randolph?!? He’s good for a 25-10 in the East! And if it doesn’t work out, who cares? They gave up a bad contract and a half-decent forward to take a $50 million flier on a dominant low-post player. Great move. I stand by these thoughts even if Zach starts an international incident at Scores within the next nine months. 6:16: It’s only fitting that Stern’s microphone went out right as he was announcing New Jersey’s pick at 17: troubled BC star Sean Williams, the perfect rebounder/shot-blocker on paper for the the Nets. Unfortunately, Sean couldn’t attend the draft because he’s home watching “Planet Earth” on Blu-ray and eating three bags of Doritos at once. 6:24: Jim Gray takes a break from reporting blockbuster three-team trades that don’t happen to file a dispatch from Lakers headquarters. Yaaaaaaaawn. The Kobe Saga is showing signs of turning into the new Barbaro Watch. Wake us up when they decide what to do. 6:28: Dickie V. and S.A.S. scream at each other in a split-screen for a while, followed by them making a dinner bet about whether the 2007 draft will prove deeper than the 2003 draft. Imagine being the waiter at that table? Guys, seriously, don’t bother tipping me; I slit both of my wrists 10 minutes ago and I’m bleeding to death as we speak. Thanks, though. 6:38: Gray interviews Mitch Kupchak. It turned out to be as uninformative as it was uncomfortable. Hard to believe, I know. 6:40: Our last four picks: Marco Belinelli to Nellie and the Warriors (some things are meant to be); Javaris Crittenton to the Lakers (why would a team that runs the triangle take two straight PGs in the first round? ); Jason Smith to Miami (the metrosexual David Lee); Daequan Cook to the Sixers (getting flipped to Miami for Smith, along with two railroads and $200 cash). 6:42: Bilas on Stephen A. Smith: “He needs to become more coachable and learn how to play with other people.” Whoops, he said that about Daequan Cook. Sorry about that. 6:51: I have to say, Spike Lee is really growing on me — I always enjoy his thoughts on the Knicks these days. Maybe he’s a 375th-impression guy. now I’m a 3 out of 10, and I’ll be a 5 out of 10 if they take Big Baby with one of their second-rounders. As for my Dad? Let’s call him. 6:53: “I’m still a 0 out of 10,” he says. and when it happened, we both cheered and did the whole “I can’t believe we got him at 35!” routine. Sure, it was a minor victory, but when you’re a Celtics fan these days, you take what you can get.